Jim Carrey is known for his funky personality on screen but what many people don’t know, he is also an extremely skilled martial arts athlete. He has achieved his brown belt in Brazilian Jiu Jitsu. We wouldn’t want to mess with him! While she originally started learning Martial Arts for her role in Blade Trinity, she has kept with it to keep in shape. During one of her interviews, she mentioned that she specifically trains in kickboxing. Do you ever wonder how Jennifer Aniston keeps herself in such great shape throughout the years? She trains in Budokon which was created by Cameron Shayne. Talk about a man with many talents! Famous Chef Gordon Ramsay has always had a passion for cooking but when he isn’t in the kitchen he is out training Martial Arts. He has received his black belt in Karate and and also enjoys boxing. Did you know that Demi Lovato is a heavily skilled martial arts? Well, she has been training in a full range of martial arts including boxing, kickboxing, Muay Thai and Brazilian Jiu Jitsu. Talk about a triple threat, actress, singer and Martial Arts athlete!! Actor, Ashton Kutcher who is widely known for his role on “That’s 70s Show” has been training Brazilian Jiu Jitsu for awhile now. Growing up in Iowa, he wrestled in high school and then wanted to expand to the Martial Arts sport. 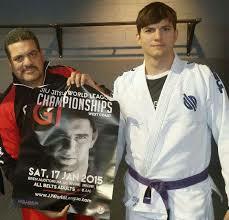 He has received his Purple belt in Brazilian Jiu Jitsu under the famous instructor, Rigan Machago. Fun fact: Ashton has traveled to Brazil on multiple occasions to train.